Hotel Atlantica Golden Beach is set in a perfect location especially for couples. relax here without children, as it's an adults only hotel. 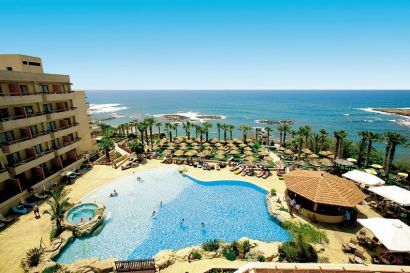 Atlantica Golden Beach Hotel is hidden amongst banana plantations, a unique feature in Paphos! As well as the plantations, the hotel have so much more to offer its guests. Everything from, simple relaxation around the pool to fine dinning and entertainment in the evenings. Hotel Atlantica Golden Beach will appeal to people who like quality. The hotel is run by Atlantica Hotels & Resorts. "Reception Staff Were Very Polite"
My boyfriend and myself had a fantastic holiday at the Atlantica Golden Beach, it was a good relaxing week with a beautiful view from our room. Our room was comfortable and clean, and the daily maid service was excellent. Reception staff were very polite and professional at all times, nothing was too much trouble for them. The food at the hotel was good, we were spoilt for choice. Restaurant staff and bar staff were also friendly. Evening entertainment was, so as you can see, we had a great holiday and will return in the future. "Definitely Return To Atlantica Golden Beach"
My partner and I had a fantastic holiday with you at Atlantica Golden Beach, a nice relaxing week, beautiful view from our room . The room was so comfy and clean, the maid service was excellent. Front desk staff very polite and helpful at all times, nothing was too much trouble, the food was excellent, spoilt for choice, all restaurant staff and bar staff very friendly and helpful, and to be honest with you I didn't want to come home. Celebrated my birthday with you which was so good. Evening entertainment was very good, all Thomson staff very pleasant and helpful also, in my opinion Atlantica deserves a 5*plus. We will definitely return to Atlantica Golden Beach, soon I hope. Thank you so much to all at Atlantica. "Drinks In The Hotel Are Expensive"
We had an excellent holiday, the quality and choice of the food was better than buffets on some cruise ships. The food was displayed at different points of the restaurant so there was not the queue and shuffle normally associated with buffets. The entertainment was far better than could be expected at other hotels, with Thomson's Production company calling in 4 times a fortnight and guest artistes doing an hour each night, along with the holiday reps who are quite talented, every evening we felt we had been well entertained each night. The hotel is well run, with a good ambiance and the management and staff show that extra effort. The beach is small with some stones but bathing shoes get you into the sheltered cove, protected from the breakers. The sunbeds on the beach are not owned by the hotel and must be paid for daily. Drinks in the hotel are expensive for those not on all inclusive drinks package (CY £9.75 per day). Local buses are frequent for Coral bay which is close by or Paphos which is 8Km away. The bedrooms are comfortable, if a little tired. At the end of September 2007 building work began on the next plot to the north of the hotel at 8.00 each morning, so best to check if it is complete at the time of your holiday. Overall 10/10. "Lounge Areas And Pool Areas Are Beautiful"
This hotel is perfect for a relaxing holiday with no kids. The staff cannot do enough for you and the food is fantastic. The lounge areas and pool areas are beautiful and clean, the hotel is rated at a 4* but could easily be a 5* if the rooms were a bit more modernised, they were clean and tidy but slightly worn looking, which is a shame as the food and choice of food is fantastic and I would recommend going all inclusive. The managers even came out to say goodbye to everyone when we left, nice touch. Perfect for quiet holiday.